Two things that enjoy massive popularity on the internet are Facebook and WordPress. Often you will see people try to combine the two by putting a normal old like button on there WordPress website. The problem with this is that the standard Facebook like button is small, gives no information about the page being liked and is not very enticing. In fact it is so unnoticeable that people often skip right by it without even seeing it. 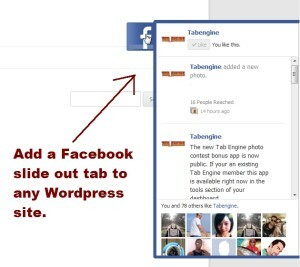 In an effort to give WordPress site users an viable way to encourage there site visitors to like there fan page I have developed the WordPress Facebook Slider plugin. Using this plugin you can add a slide out pop up that will allow your site visitors to like any Facebook fan page you choose. It will also display the most recent posts you made on your fan page as well as other information such as like count. This type of plugin creates a much greater opportunity for people to like your fan page from your website than just a generic like button. You can grab a FREE copy of this plugin by clicking the link below. Thank you Bret for this plugin. I’ve just downloaded it and I’m going to install it on XXXXXX later on. WP Facebook slider zip down load failed – server problem. Please provide good download link or email it ( zip) to me. Unable to redirect from First Social. That plug in has not been updated in quite a while. It might not work with the latest WP version. Honestly I have not tested it. Thanks so much for the free plugin. I hope that you have a safe and prosperous New Year ! Thanks this looks like a great addition to the FB notification i purchased from you, thanks!